Provide best practice, sports medicine and allied health expertise to our valued patients. Treat all patients with the level of care, dignity and respect that they expect, adhering to our various professions’ governing codes of conduct and ethics. Meet and exceed our patients’ expectations by providing a dedicated, experienced and multidisciplinary approach to injury management, advice and prevention. Keep abreast of the latest scientific research in the areas of sports injury management and, in turn, make these services available to these patients for optimum injury management. Be pro-active in providing wellness services to the non-injured client such as Pilates, bike setup, exercise groups etc., to improve quality of life and/or athletic performance. Act as a resource service for the wider community by providing speeches, seminars, information sessions etc., upon request. 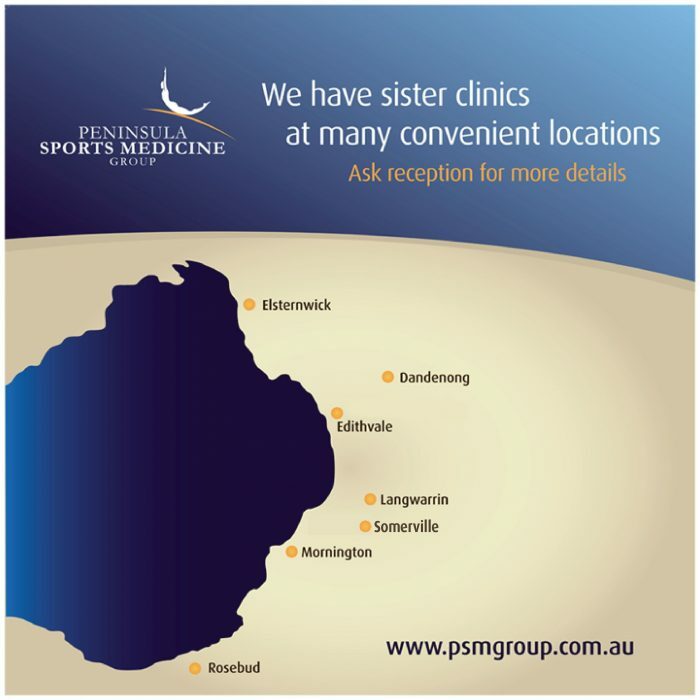 PSM Group has been supporting the local Peninsula and Bayside communities for more than 20 years by providing sponsorship, information evenings, sports coverage and assistance to local sporting clubs and associations. We have formed strong relationships with the following organisations. If your club or association would like to join our community, please contact us.